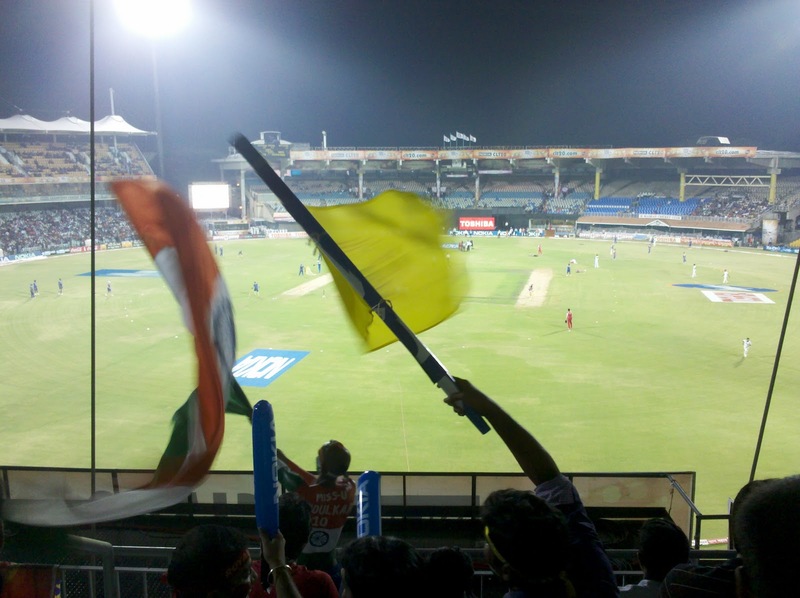 Maradhi Manni: A Non-cricket Lover's Review of the CL T20 Final! 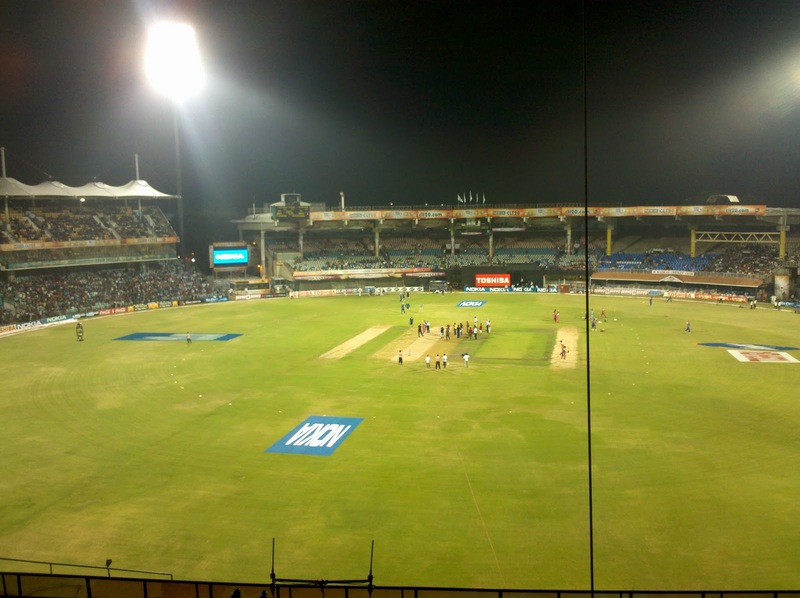 A Non-cricket Lover's Review of the CL T20 Final! This skinny boy was the hero of the crowd on our side of the stadium! 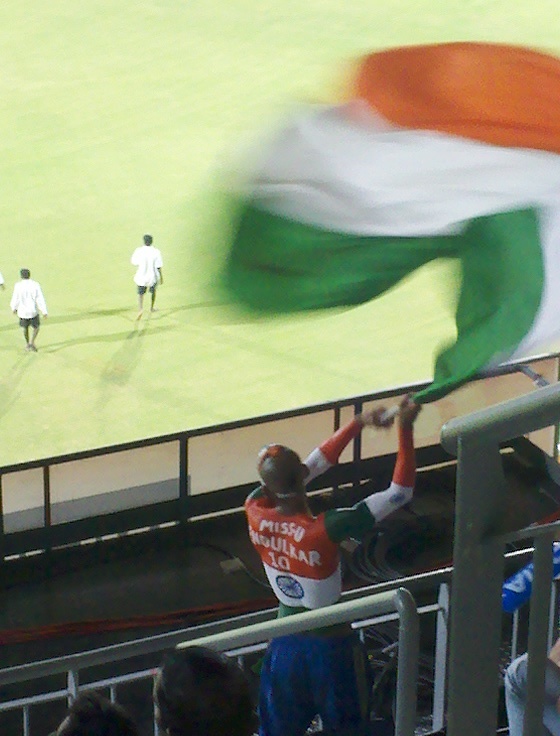 He was continuously waving our Indian flag which was quite big and honking the conch in-between, throughout the nearly 3 hour match! Everybody missed Sachin 'in action', here! I used to like watching cricket when so many matches were not played...World Cup matches once in four years (! ), then our team visiting other countries and others visiting us to play matches...it was interesting because the gap was more between matches and the match was between different countries playing against each other! Everybody's patriotism went to the hilt and the game was more emotional. Then one-dayers came...OK, even they were interesting! Now, these commercial matches don't fancy me! One more thing is, my husband and son seem to be glued to these 'tok tok' matches, whenever they are home! I am made to sit alone in front of another TV (they got me one to shut me up from complaining!) and watch my reality musical shows...before these 'too much' cricket matches, all of us, well, my husband and I, were watching these shows together chatting and discussing and praising the new talents. I still remember the 1983 Kapil match! We were living in a colony in a small town, Hosur and nearly 20-30 friends of my husband were sitting together and watching the match! I was running a tea-shop for all! Whenever there was a '4' or '6', the whole crowd used to clap and shout and our Andy, the Pomeranian dog, used to stand up on two of his hind legs and jump, twirling around in the same position and keep on barking at people! It was fun! We had watched a Ranji Trophy match in Bangalore when the kids were small. The players were in whites and were just distant objects moving, running here and there...we could see only that much! Then TV came and the addiction to the game grew! The day before yesterday (9th Oct.'11), my husband and son suddenly decided to watch the CLT 20 match, between Mumbai Indians and Royal Challengers (Finals) and insisted on taking me also to the match! First, I thought it might be boring because I don't follow these matches and am not familiar with the current players too! Still, I went and enjoyed watching, not the match, but the atmosphere at the stadium and the 'SPIDER CAM' (click this wikipedia link to see how it works!). It was fascinating to watch the camera hanging from four rope-like cables and capturing the game from all angles! 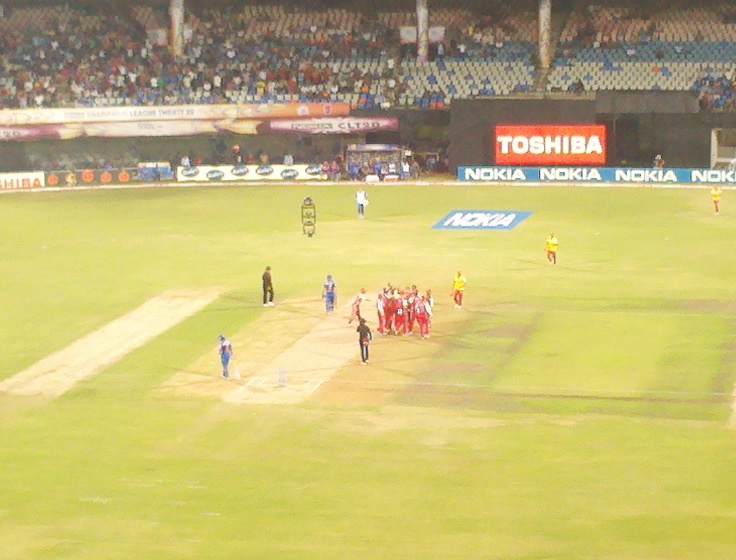 Mumbai Indians won the game and the Cup! Now, to the pictures which interested me most, than the match! We were not allowed to take even a water bottle inside! We had to 'buy' everything here! 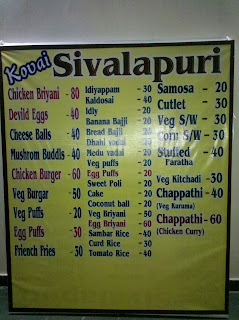 One Rs.10 Bingo/Lays pack costed Rs.30, here! But, they should also make money! 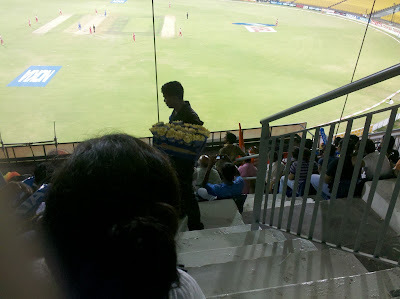 Rs.40/- per pack popcorn never fell down from the cones even when they were hanging out from the tray, how?! 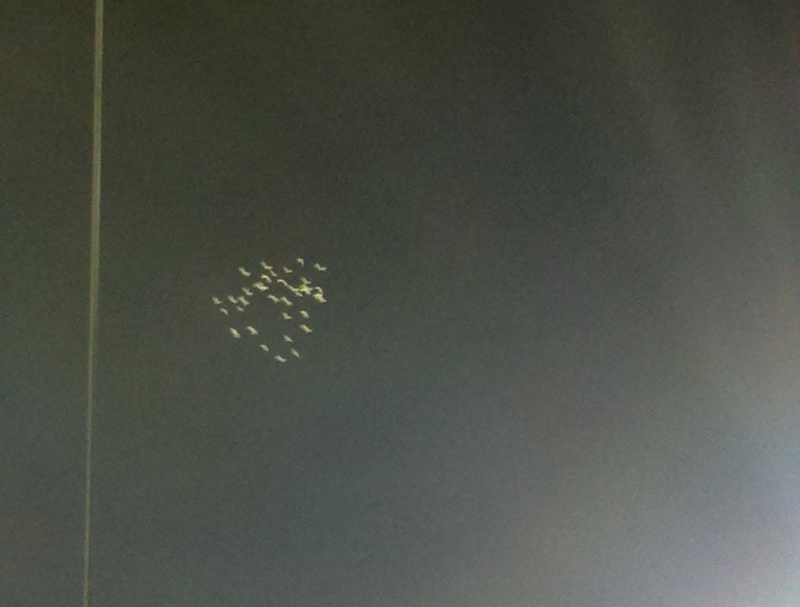 These birds were flying in the sky, from one side to the other side of the stadium area, often, maybe, because of the bright lights! I watched them until nearly 10 pm! Now, to my favourite, Spider Cam! From our seat, on a higher level, the camera looked as if it was sitting down on the ground here and waiting for the play to start! It resembles our lantern, a bit! If you click on the picture, you can see Ravi Shastri (in a suit), busy with the toss and the Spider Cam, waiting on the left side of the picture! The Camera is hanging closer to the Mumbai Indians, here! Peeping Tom?! I could recognise our Bajji, Ravi Shastri, Malinga (his designer hair makes him stand out in any crowd!) and Vettori! I know the game(! ), so, was able to watch the match as a distraction from other more interesting happenings! I noticed small children with parents, also enjoying the game! The crowd loved Malinga and was always clapping and shouting his name whenever he started bowling! The boy who sat behind me, must be speaking in sign language now as he was screaming his lungs out! Bajji was addressed as 'Thalaivaa', meaning 'leader', whenever he was in action! Yes, I will remember this match always, I think! This is the entrance to the M.A. Chidambaram Cricket Stadium! We were allowed to take our cell phone inside but had to throw away the battery of our camera and take just the camera inside! 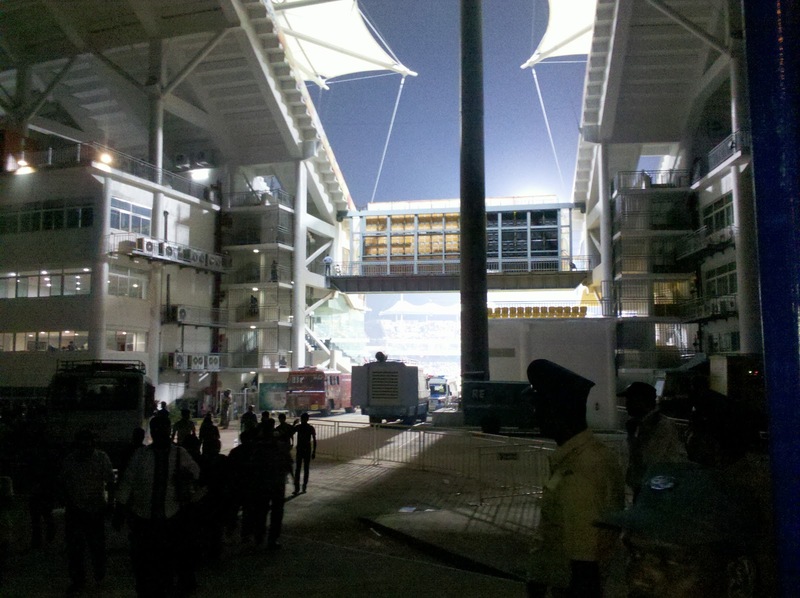 When we came came out after the game, we found the battery, where we had thrown it, fixed the camera and clicked this picture! I took this picture before entering the stadium. I asked this boy, who was selling this flag, 'Yevloda vele?' (What is the price? )..his reply, 'Nooru rooba' (100 rupees)! Smart fellow, na? Cricket lovers are going to hate this review! Edited to add (12.10.11): I am trying the new Blogger Interface for this post! It was difficult for me to adjust the spaces between the captions and the photos and so it was looking horrible, which I found after publishing, yesterday! So, I had to hit the 'unpublish' button, correct all the mistakes and publish again now! I went to this stadium when I was young. There was a match between Kenya and Bangladesh and obviously we got tickets! Floodlights were introduced newly then, and it was a treat to watch the match under floodlights. 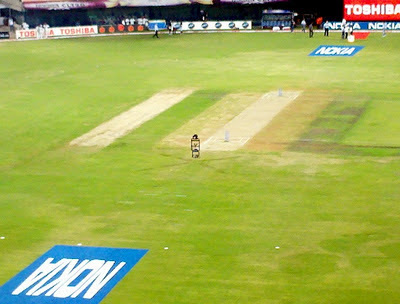 But the fifty overs match was taking more time and it was quite boring (as India was not playing there). Now, I don't watch cricket even on TV. GOD I want to watch a match in india in a stadium for sure .. Last time in the IPL I had tickets but could not make it .. always something comes up .. I still watch it on tV the whole Reason why i had to subscribe to SKY and pay them each month ..
DESTINATION INFINITY: You don't watch cricket in TV too? GOOD! BIKRAM: 20-20 match is going to be common, in the future! I like matches played between countries...we can cheer our players! Come home and watch Dhoni, Yuvraj, Dravid and other good players playing for our country! This is one of the best reviews of the match and the pictures brought the scene before my mind's eye. Too much of anything stales and the surfeit of these commercial matches devised solely to aid some people/institutions to make huge money all round the year non stop is a national distraction that needs to be put an end to forthwith.The other countries do go ga ga over soccer or baseball but these games hardly assail their nations with such frequency for such long durations.It is a national waste in a cricket crazy nation like ours.We are reduced to suckers by the wily cricket boards,greedy players and the avaricious business houses including TV channels in their race after lucre. I was a cricket buff having played league cricket in my younger days but this is too much.I would rather watch 2G scam on TV than T20 finals!! Well done Sandhya,it is a hilarious post. I have not been to a match and dont intend to either. To sit there for long hours is a perpetual put off. But I must say, your post is lending me a thought that I perhaps must see it through ! When i clicked this post on my side bar yesterday it said - page not found . KPARTHASARATHY: Thanks for the compliments, Partha Sir! All the pictures were taken from my mobile phone! Even now people apply for leave on the final matches of IPL! Ours is really a cricket crazy nation! Rich people become richer using this attitude! You played in league matches? My husband used to play for his school, it seems! So, 2G scam is more interesting, eh? Karunanidhi is watching...! KAVI: Welcome to my blog, Kavi Arasu! I am very happy to see you here! I just noticed glimpses of the match! Watching other people and their behaviour was more interesting! Nearly 10% of the audience were policemen and women and they were chatting and enjoying within themselves! 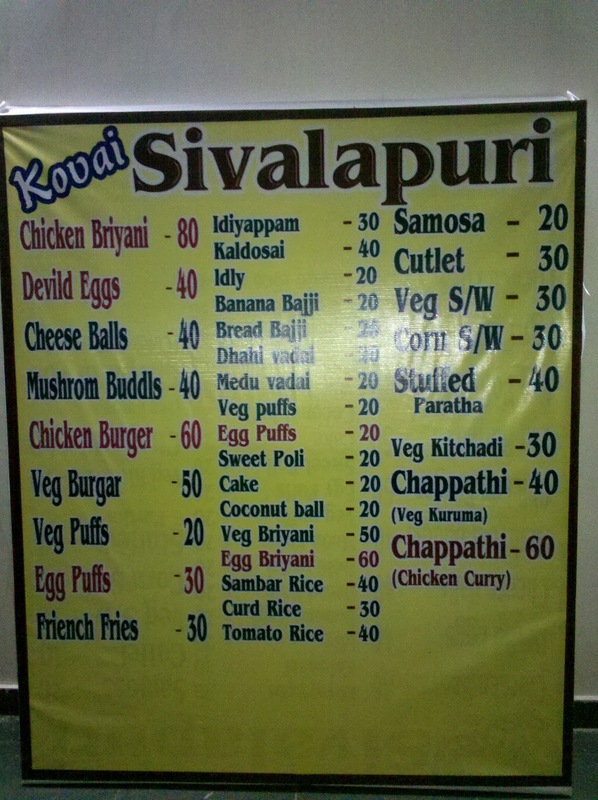 Many people were bent on eating whatever was available, at any price! One visit is enough for me, though! You too do that once, just to enjoy the atmosphere, Kavi! Thank you! KAVITA: I call the cricket matches as 'tok tok'! The thrill is not there anymore! Yes, I was very happy to have the battery back! Otherwise I must go out and buy one as early as possible because I use this camera a lot, than the Nikon, which is bigger in size but gives better picture! Carrying is the problem! Thanks for the visit to my dreamscapes..
i too have lost interest in cricket matches but will watch when my husband or brother watch it, no other go ;) sometimes its fun other times not so good. DREAMSCAPES: Welcome here! Nowadays, we watch more than 25 matches per month, which is becoming too boring! VARUNAVI: You saw Gavaskar in person, great! Watching the match is TV is better. We can see the players' expressions too! Watching once in person is more than enough! I loved this review! You added so many fun angles to a match, Sandhya! interesting very interesting ! even though it wasnt bout just cricket ! 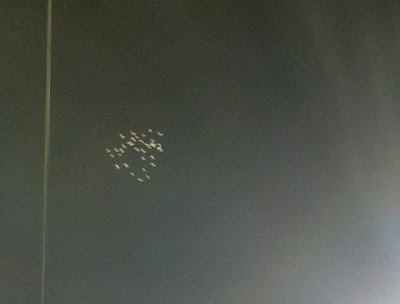 WORDSNDREAMZ: The spider cam was the most fascinating thing in the match, well, at least for me! Sometimes it was moving very fast. It looked as if it will drop on some player's head! It looked very close to the players' heads from our angle - on a higher level and moving fast in the cable, here and there! My husband used to watch the matches live when he was young, not now! Son also is not keen on going and sitting in the stadium. TV viewing is better. This was just for fun! Go to Lord's once and watch! Poohi also might enjoy the crowd! HITCHWRITER: I was wondering how you, a cricket addict, like my husband and son, would feel, reading THIS review! Well...this is a different angle! now a days Cricket is available 24 hours. and with fixing cases it has reduced its status. SM: That is the reason most of us have lost interest in cricket! It is not 'our players, our country' anymore! Just individual players are playing, SM! ARAGORN: Welcome to my blog, PS! Nowadays, I am not interested in cricket at all! Too much cricket viewing by son and Husband! Yes, I was fascinated by the people who watched the match and other things at the stadium, which was more interesting for me! Wish You All A Very Happy Navaraathri!